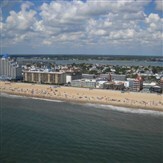 Enjoy a day on Ocean City's beach and boardwalk! There is NO Bath House in Ocean City, Maryland! Pick up and Drop off is @ Inlet.